Pros: Engaging, family friendly and sure to leave you with a smile on your face. Cons: Uncertainty of whether the performance stands out from other pantomimes on offer this holiday season. Cheesy but in the best possible sense of the word. 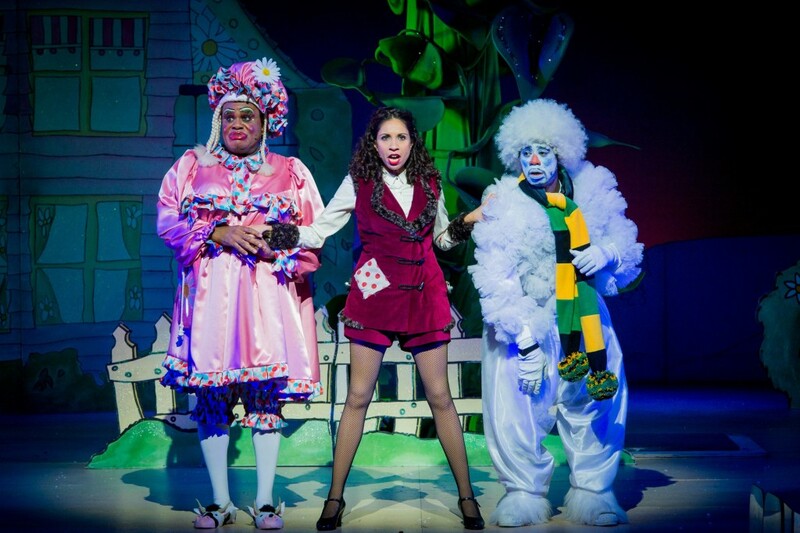 Pantomime season is well and truly off to a cracking start! Oh no they didn’t, oh yes they did! 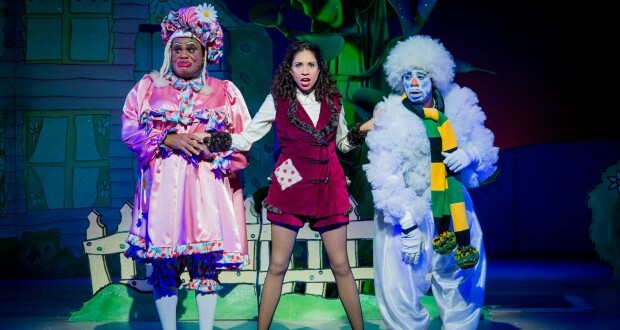 Jack and the Beanstalk at the prestigious Hackney Empire has more than managed to grab audience’s attention this holiday season. Filled with glitz, glamour and plenty of sparkle, this full scale production engages individuals of all ages, from the young and enthused teens, to the more mature mums and dads. This makes it an ideal night out for the whole family and is guaranteed to leave you chuckling all the way home. Based on the traditional children’s book, Jack and the Beanstalk is a regular favourite for many panto-goers around Christmas time, with this production being no different. The costumes and set are very much larger than life and the how the dame (Clive Rowe) manages to drag around that frock of his I will never know. However, what I do know is that he plays the part with utter comedic flare and you cannot help but take a shine to him as a character. Albeit Rowe’s role is, to be frank, bonkers, he is the troublesome ringmaster of the entire production. He aids the energetic Jack (Debbie Kurup) as he (or in this instance she) ascends the florescent green beanstalk in search of riches, and better still an end to the suffering brought upon the world by the dreaded giant. Oh, and not to forget his energetic bug-like henchmen who regularly steal riches from the earth below and will have you booing till the cows come home. Funnily enough, this is the conclusion of the entire piece, getting Jack’s valiant and trusted cow Buttercup back from the exceedingly cute and likeable Mother Nature (played by the talented Julia Sutton). A particular stand out performance was by Sutton, who I felt delivered a very engaging and honest portrayal of the long lost love of the unfriendly giant. 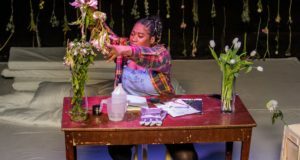 With a touch of creativity added on behalf of the writers and composers of the piece, the storyline was set in the bright and breezy Hackney Dale. This makes the imagined world of Jack and the Beanstalk that little bit more realistic, and in fact personal to the local community. Another addition was the exceedingly cool Jamaican snow man (no pun intended) who was a welcomed breathe of fresh air to the performance as a whole. It’s also fair to the say that the musical score had everyone well and truly tapping their feet from balmy beginning to exhilarating end. 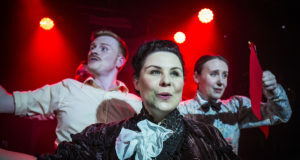 It takes you on a rickety ride through the music charts, with songs by Taylor Swift, Mark Ronson and Jess Glynne, offering the piece a rather contemporary feel, and furthermore giving audiences no excuse for not knowing the lyrics. Smart move indeed. The set designer and costumes department deserve commendation for their skills in making this work possible. Lotte Collett and Steven Edis have done a marvellous job in capturing the dream-like feel of the story book and have cleverly utilised the entirety of the space to create a very grand and eye catching picture on stage. The giant, who I think no one expected to actually see on stage, was fully functioning and darting around the stage to the point of being somewhat realistic, as was our four legged friend Buttercup the cow. I believe my only critique lies in whether the performance stood out from any other pantomime on offer this holiday season, and perhaps it needed more of a stamp of individuality to really run ahead of the competition. Overall, the production is cheesy but in the best possible sense of the word. Pantomime season is well and truly off to a cracking start, and should leave you feeling merry and bright just in time for Christmas! Currently in his final year as a theatre graduate, Luke is hoping to achieve a successful career as an actor (and earn some money from it…..fingers crossed). Living abroad in Chicago, Australia, Sweden and Switzerland has definitely wetted his appetite for travel and broadened his skills as a dancer, singer, reviewer, theatre practitioner. Sadly though, he's not bilingual; his swarve Yorkshire accent is enough to confuse anyone. Being Yorkshire born and bred, besides making a cracking brew, everything he utters has a sprinkling of northern flare. What can I say, it’s in the blood? Not the biggest fan of work that tries to be too abstract and in which audience reactions tend to be a cross between smelling something bad and waiting for the bus. Otherwise he is open to most styles that get to the point.